'The Wolfman' is nothing that viewers have not seen before. The image of the werewolf running wild by night and the man reconciling himself to this fate by day is hardly new to our screens, leaving the film with quite a challenge - how do you do something new with a tired genre? While the story isn't brilliant the superb crafting, from director Joe Johnston, of this film saves it from becoming another low grade horror film. In fact, it would be doing the film a disservice to lump it in to that particular genre. Instead, this is storytelling at its most gothic and macabre, although still full of plenty of gore for horror fans. The film focuses on Lawrence Talbot (Benicio del Toro), an actor who is called back to England by his brother’s fiancée (Emily Blunt) after he disappears. His brother’s corpse becomes one of several who have been found ripped apart in the local area and so ensues the hunt for the beast responsible. This ultimately leads to Lawrence getting bitten and transformed. Set in the 1880s the action takes place in a gloomy, windswept England which is as disconcerting for the viewers as the characters - you remain well aware that things may be lurking at the edge of the screen that you cannot quite see. Overall, the film feels as if it is of two halves. The first half is gripping - the screen is often littered with lost limbs and disembowelled bodies that are made all the more terrifying because the beast is still an unknown quantity. Once the audience see a fully transformed Lawrence much of the horror and intrigue is lost. The first hour is also very tense, with plenty of jumpy moments, many of which are completely unexpected, making it exciting and rather scary to watch. In true gothic style, there are many small and worrying clues as to the tale’s conclusion that add to the eerie atmosphere and sense of unease that pervade the film. The second half of the film gives itself over more fully to the story and the blossoming romance between Lawrence and Gwen, although a brief stint in a lunatic asylum and the impressive and unsettling transformation scenes between man and wolf mean it does not become staid. A darkly comic turn from Hugo Weaving as a policeman investigating the beast adds another layer to the story and keeps it fresh and entertaining. 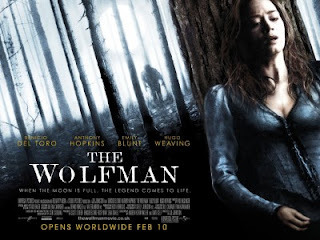 Anyone looking for a horror film will be disappointed by 'The Wolfman' but those who enjoy well-told tales of the macabre should find this rich with mystery and may even get a fright along the way.